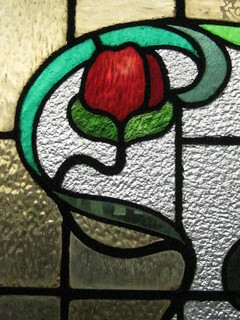 “Leadlights are decorative windows made of small pieces of glass supported in lead cames (frames). 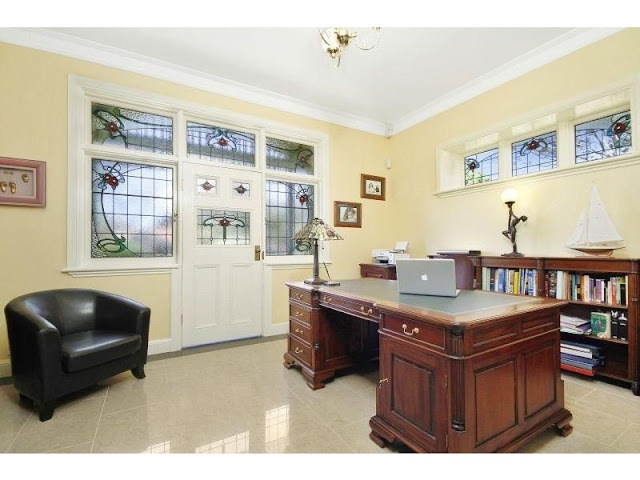 Glass may be clear or coloured and it may be plain, textured, bevelled or etched. 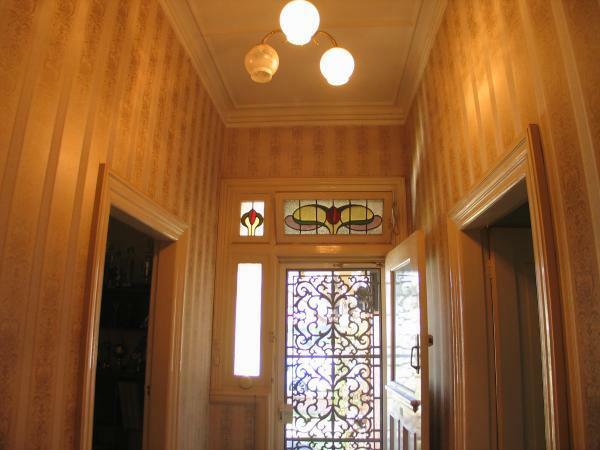 “The craft of leadlighting has been around for centuries and their designs are a reflection of the art of the day. The earliest versions were created by the Romans and Byzantines. From the thirteenth century churches and public buildings in Europe had elaborate leadlight windows such as the rose windows of Notre Dame Cathedral in Paris. A leadlight church window, Czech Republic, combines traditional diamond panes with the pale translucent and textured quality of modern so-called “cathedral glass“. 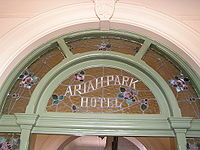 A fine example of domestic leadlighting above the residential entrance of a 19th century Australian hotel shows the use of opaque glass so that the name might be visible both by day and night. 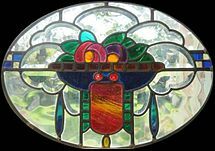 Domestic leadlight (1920s) employs an Art Deco motif in brightly coloured opalescent glass set in transparent glass which is both textured and cut with bevelled edges to reflect the light. 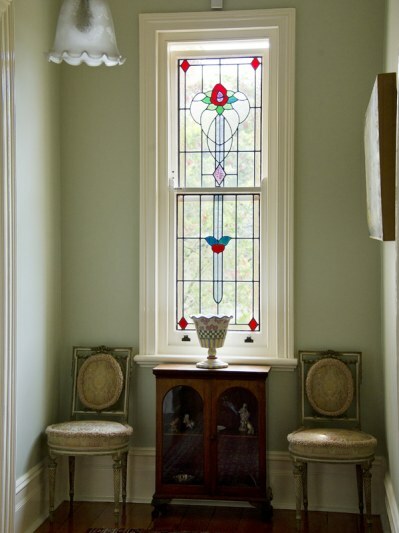 “Traditionally, leadlight windows differ from stained glass windows principally in being less complex in design and employing simpler techniques of manufacture. 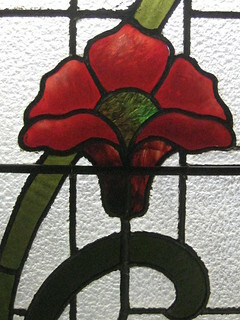 Stained glass windows, such as those commonly found in churches, usually include design components that have been painted onto the glass and fired in a kiln before assembly. The extra time and cost employed in painting and firing the glass usually prohibited its use in domestic architecture. 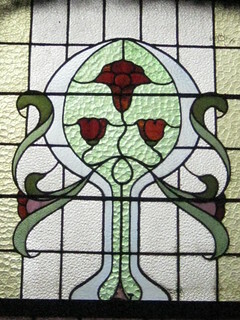 While stained glass windows are found principally in churches and ornate buildings, leadlight windows, which rarely employ painted components, are much more common, and from the 1860s to the 1930s were a regular architectural feature in many private houses and cottages, where their style is often a clue to the age of the building. 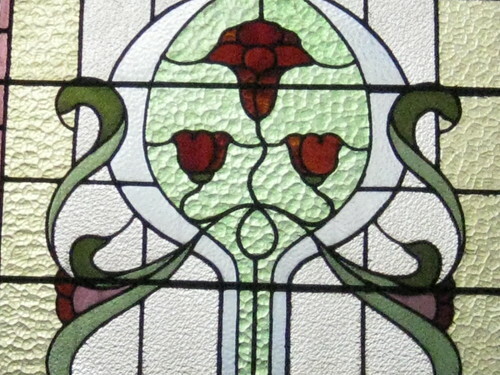 Unlike stained glass windows which are traditionally pictorial or of elaborate design, traditional leadlight windows are generally non-pictorial, containing geometric designs and formalised plant motifs. Leadlight windows almost always employ the use of quarries, pieces of glass cut into regular geometric shapes, sometimes square, rectangular or circular but most frequently diamond shaped, creating a “diaper” pattern. 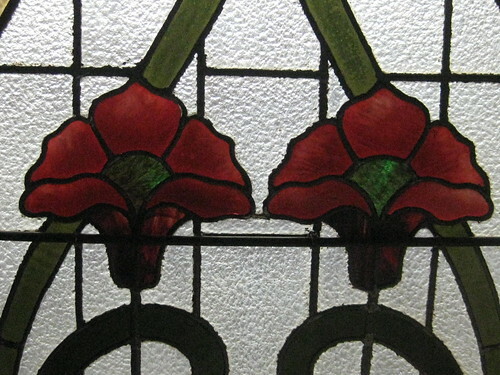 A further difference between traditional stained glass and leadlight is that the former almost always has painted pictorial details over much of the glass, requiring separate firing after painting by the artist. Sydney Central Station, NSW, Australia. Despite the complexity, the execution was classed as “leadlighting”. 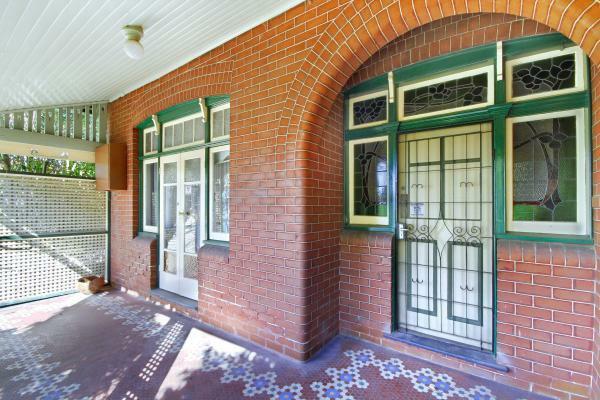 An Art Deco domestic casement window,Melbourne, Australia, shows a wide variety of textured glass with some streaky glass in muted colours. 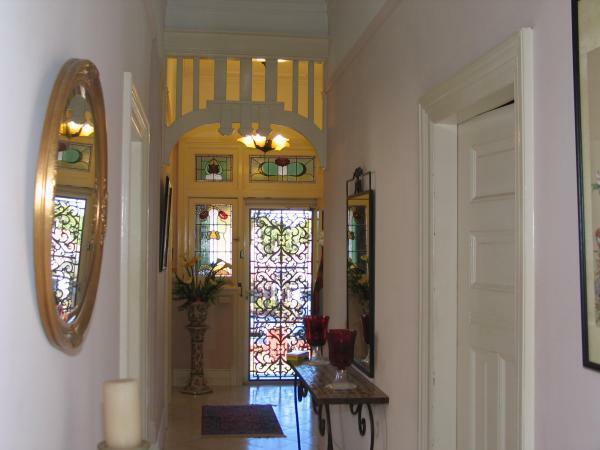 “Prior to World War I, in domestic architecture, the front entrance remained the focus for decorative leadlighting. It was also commonly used for stair-well windows, but was uncommon in other locations where large panes of glass were valued over small ones. 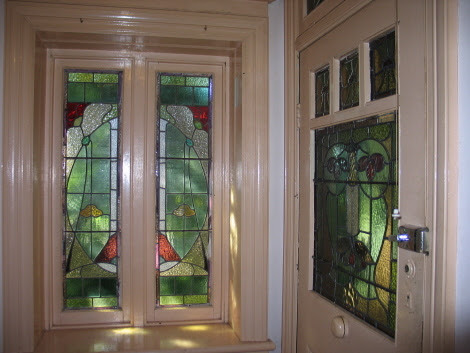 In domestic architecture, after World War I, the focus on the decoration of the front door became less common, and the front windows became the location of leadlighting. With the “bungalow” style of architecture becoming increasingly popular, sash windows were also often made with leadlighting, often incorporating sections of glass very much larger than in traditional diapered windows. 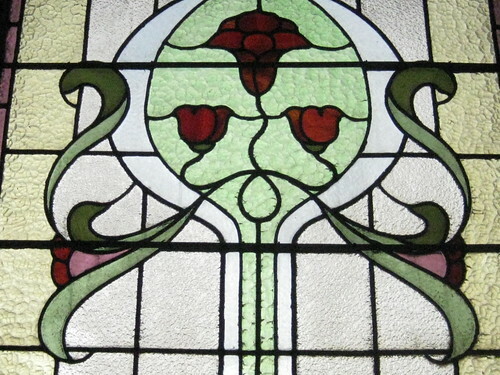 This trend continued until World War II, the style evolving from Art Nouveau to Art Deco, which both employed a great variety of glass, including cathedral glass and opalescent glass, as well as bevelled glass. 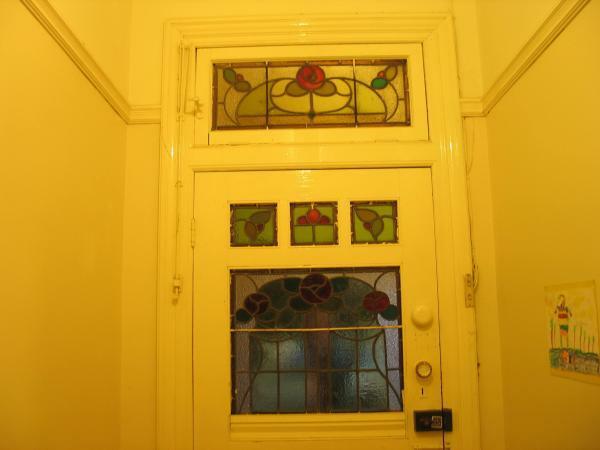 From 1940 until about 1980 domestic leadlighting was less common. Federation homes (c.1900-1915) and early Californian Bungalows (c.1916-1925) typically had high-waisted, three panel doors with leadlights. 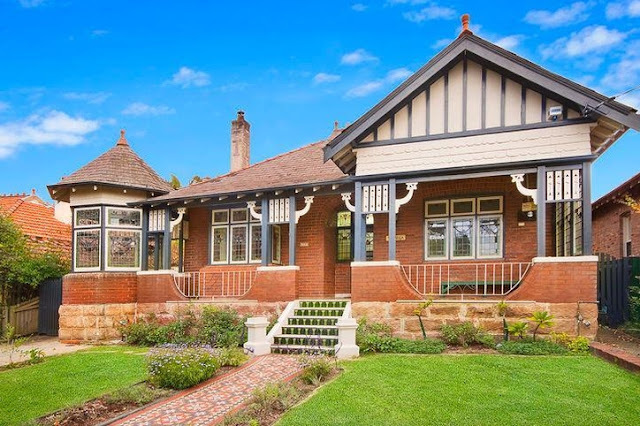 Some Federation (c.1900-1915) homes and early Californian Bungalows (c.1916-1925) have leadlights in the double, triple or quadruple casement windows of the front rooms. 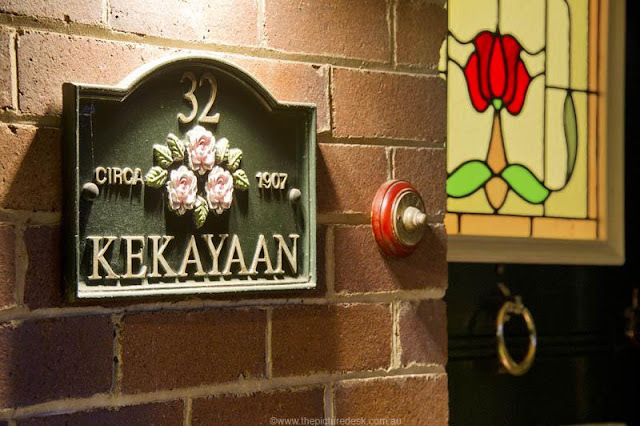 Many houses built before 1925 feature leadlights in designs representing a transition between the ornate and natural Art Nouveau and the simplified and geometric Art Deco styles. The designs are precursors to the final evolution of classical Art Deco. Lines have more subtle curves than classical Art Nouveau. Flowers in a representational form are used. 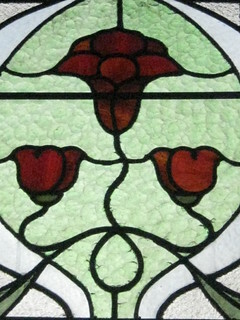 Coloured glass is sometimes limited to a border or a central design. 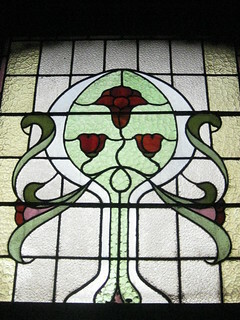 Many leadlights feature the ‘Macintosh (or Scottish) Rose’, an almost circular, stylised rose designed by Rennie Macintosh as part of his interpretation of Art Nouveau.